Israeli blockchain entrepreneur Moshe Hogeg is negotiating to buy Beitar Jerusalem Football Club, Israeli news site Ynet News reported on Thursday. On Wednesday evening, Ynet reported that the club’s current owner, Israeli businessman Eli Tabib, had agreed to an offer of $6.5 million (NIS 24 million). Later, the news site reported that Tabib had rejected the offer, asking for an additional $1.1 million (NIS 4 million). The football club reportedly carries a debt of $2.2 million (NIS 8 million), more than it disclosed during earlier negotiations. Ynet cited Hogeg as saying he will not pay “a shekel more” than the previously agreed-upon sum. A spokesman for Hogeg declined Calcalist’s request for comment on Thursday. Hogeg is the co-founder and chairman of venture capital firm Singulariteam Ltd., which invests in startups in fields such as artificial intelligence, robotic, AR, and VR. Hogeg founded blockchain-based phone company Sirin Labs in 2013 in partnership with Kazakhstan-born businessman Kenges Rakishev. In 2016, the company launched what it called the world's most secure phone, pricing it at $14,000. In March 2017, Sirin Labs let go a third of its employees. In September of that year, the company announced a pivot to blockchain. The company raised $157.8 million in a December ICO, announcing it will use the proceeds to develop and produce FINNEY, a new blockchain technology-based phone. In June, Calcalist reported that Hogeg had bought $19 million worth of real estate in Israel—paying part of that sum in bitcoin. In May, six-time national champion Beitar Jerusalem announced a plan to add U.S. President Donald Trump’s last name to its team name, as a tribute to Trump’s decision to move the U.S. embassy from Tel Aviv to Jerusalem. Founded in 1936, Beitar Jerusalem is politically affiliated with the right-wing and is historically associated with Israel’s governing party, the Likud-National Liberal Movement. 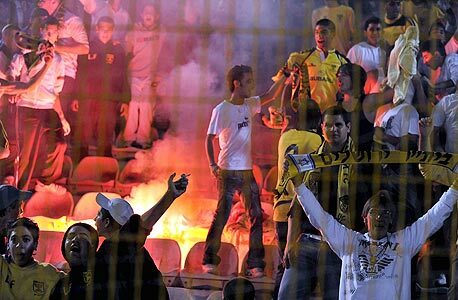 Beitar is the only Israeli club playing in the country’s premier league to have never signed a player belonging to the Arab minority, which makes up roughly 20% of Israel’s population.